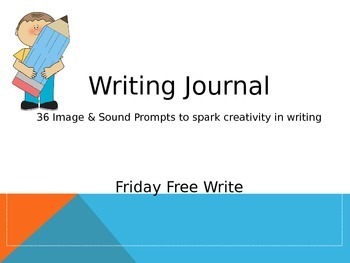 Weekly Writing Journal Prompts - Images and Sounds for the Entire School Year! 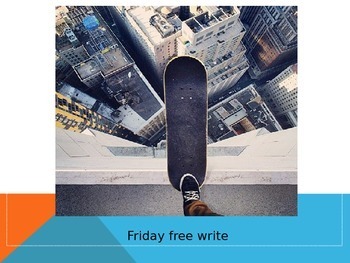 I love using Friday Free Write in my classroom to spark interest and excitement about writing. Students are allowed to use their imaginations to create stories about 36 different pictures and sounds clips - one for each week of the school year. 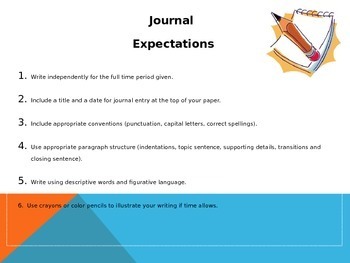 Display these using PowerPoint to the entire class, or have students complete the journal writing at an independent center. 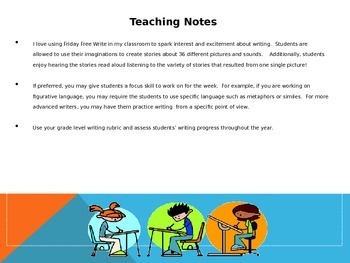 When completed, allow students to share their stories aloud. They enjoy listening to the variety of stories that resulted from one single picture! While the pictures and images are not dated with specific dates, they are in order by season to correspond with the school year. (Fall, Winter, Spring and Summer). There are images that relate to holidays within each of the seasons. Enjoy using these weekly throughout the school year. The images and sounds give students the opportunity to be completely creative. If preferred, you may give students a focus skill to work on for the week. For example, if you are working on figurative language, you may require the students to use specific language such as metaphors or similes. For more advanced writers, you may have them practice writing from a specific point of view. Use your grade level writing rubric and assess students’ writing progress throughout the year.